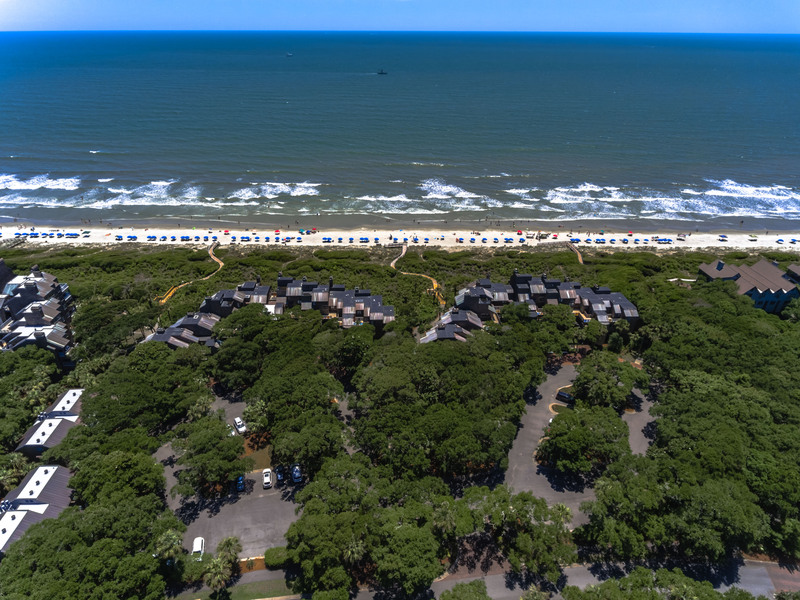 This Kiawah Island oceanfront vacation rental, located at 4307 Sea Forest Drive, features two bedrooms, a spacious deck, and ocean views. An elevated first floor end unit, the villa offers an abundance of natural light and easy beach access. The living area features comfortable furnishings, flat-screen TV with Google Chromecast (access via your smartphone or computer, with Google Home App), wet bar, and access to the deck. Between the kitchen and living room is the dining room with seating for eight people. The fully equipped kitchen allows for easy meal prep while still being connected to the activities in the living room. The master suite features a queen bed, private bathroom with bathtub/shower combo, and ocean views. The second bedroom, located near the villa’s entry, has a full bed and twin bunk beds, and private access to the hall bathroom. Being an end unit, the villa affords a spacious corner deck, partially covered and partially uncovered. It’s a great place for al fresco dining or soaking up the ocean breezes. The villa is equipped with washer, dryer, and high speed wireless internet. What a wonderful week at this lovely condo just steps away from the beach! The condo was comfortable and homey. The location could not have been better! Waking up to an ocean view was the cherry on top! Thank you for helping us create wonderful memories with our three grown kids! Great setting to spend a vacation. The lanai had comfy furniture to sit outside and enjoy the ocean view. The condo was well furnished and had everything you need for a great vacation. Beautiful beach just a short walk across the boardwalk. Our family spent 4 nights here and we’re ext happy with the home and location. The photos of the patio and ocean view do not do justice to the reality. Amazing ocean view and relaxing ocean breezes. Proximity to the beach is key. Super close, easy walk. Bring or rent bikes and enjoy riding down the beach and through incredible neighborhoods. The home itself is nice and well kept. Could use some board games - we did love the card games. Beautiful island. Great beach and ocean views from the large porch. Villa was perfect for a special wedding weekend in Kiawah! Loved the porch view of the ocean! We had a great time staying in this vacation rental over spring break with our 3 kids. Would definitely book here again. Our villa was nicely appointed and clean. Access was easy and checkout was the same. We very much enjoyed the setting and the carefully tended ecology of Kiawah Island. We were off season, and the peace and quiet were a decided bonus. We thoroughly enjoyed a close proximity to the beach as well as the lovely deck with beautiful ocean views. The end unit is especially private. great place to lay back. very satisfied. the only thing was a little tough getting to and from the beach do to the closed walk ways do to the storm. Hi Jack, Thank you for your feedback! We are very pleased you enjoyed your stay. Hurricane Irma did cause some damage to the boardwalks but the town of Kiawah is working hard to get them repaired. We apologize for any inconvenience. This is the second year in a row that we have stayed at this villa. It's the perfect location for us. Right off the beach and enough room for all 6 of us. The bunk beds are great for our kids and having a full second bathroom is perfect for when everyone wants to get cleaned up at the same time. We will definitely stay here again! Perfect location and we loved the deck! We would rent this unit again. The only slight negative was the master bedroom bed is only a full, or a very small Queen. Hi Matthew, Thank you for the review on this lovely, oceanview villa! The bed in the master does measure to be a queen, but the other bed (not bunk) in the guest room is a full. Please do not hesitate to reach out for your next Kiawah stay. We would love to be your hosts again! Easy Beach Access Ideal for Families! When our original rental was no longer available due to construction above the unit, Akers Ellis offered us three other choices. We were able to "upgrade" with no additional charge, to an ocean-view room. Although the unit was not as nice and updated as our original rental, we were so happy with the upgraded location. With two infants and two toddlers, the 2 minute walk to the beach was perfect! The unit was pretty clean, and it included most everything we would have expected. As there was a coffee maker and filters already provided, it would have been a nice courtesy to include 1-2 servings of coffee, just to get through the first morning, in case renters don't have a chance to pick any up on their way in. Overall, a great location and experience, and I would highly recommend it to others.